WWDC 2012 Banners: "Where great ideas go on to do great things." Apple has already started decorating Moscone with banners in preparation for WWDC 2012. 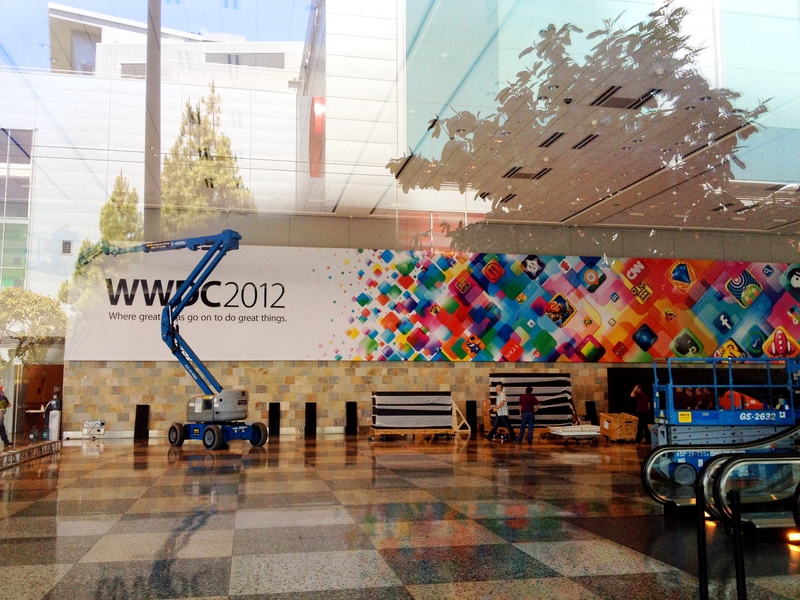 The first banners show a collage of app icons and the wording: "WWDC2012: Where great ideas go on to do great things." The annual developer's conference kicks off on Monday with a Keynote Address. Apple is expected to introduce a number of new products and likely preview iOS 6. Why am I getting the feeling this is going to be the most iterative update to iOS yet? I didn't realize ideas were capable of doing things. Whether the Macs get updated or not, or even if iOS 6 is disappointing, there's no denying Apple's banners are definitely well designed. Very visually appealing. You're living in the past buddy. That's a clumsy phrase for Apple in my opinion. "go on to do"? Really? Needs a great action verb there. If that's all we get with iOS it will be a big fail. Next monday I will go in to work and patiently wait till the keynote starts at 1(Eastern Time). If there is no UI change i will literally stand up and punch the first coworker i see in the face. Furthermore, if the next iPhone comes out with an extra .5 inch and they add another row of freaking apps my monitor will get some airplay across the office. I'm expecting iOS6 and Mountain Lion previews and release dates. (Hopefully not the generalized "summer" they usually do. Mac updates also seem to be confirmed at this point. How much time will be spent on them, who knows? I don't want to get into which ones will be updated and how much of an update each gets. Let's just let it happen when it happens and complain then. I don't expect an iPhone 5 yet. I suspect the New iPhone will be released when iOS6 is out so they can put it right on the phone day 1. But would they do the same for the Mac's? Probably not. Lion is great as it is. I assume both iOS6 and Mountain Lion will be free. Yeah, free. Sounds strange, but Apple did say they were going down a new path now. If anything ML will be $30 at most. iOS will be free no matter what. I wouldn't be surprised if ML was free though. Since OS X updates are going to be yearly now and they're integrating update into the App Store, they'll probably want to push them right to your computer as soon as they release them. And at this point there's no big reason to charge anymore. Especially since it's now download only and their money comes from hardware. OS X is just part of the hardware. Part of the whole widget.